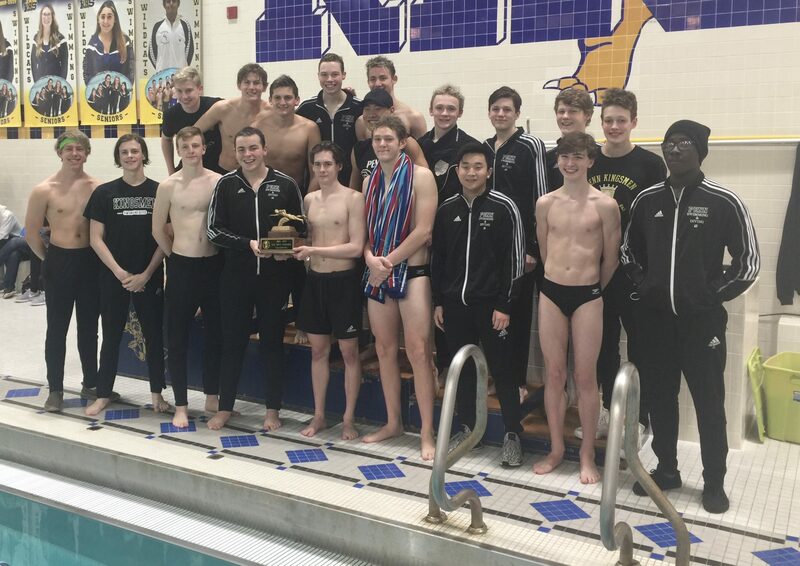 Penn High’s Kingsmen captured the Northern Indiana Conference Championship in Boys Swimming by dominating the competition in the meet at South Bend Riley on Saturday, Jan. 26, 2019. Penn placed first among the 13 NIC teams with 555.5 points. Riley placed second with 393.5 points, and New Prairie was third at 293.5. Penn’s Evan Dies was named NIC co-MVP, and Penn coach Jess Preston was named NIC Coach of the Year. Evan Dies and Aaron Dies won four blue ribbons each in the NIC meet. Aaron Dies, Evan Dies, Joel Cummins and Connor Craig placed first in the 200 medley relay with a time of 1:38.85. Evan Dies earned a second blue ribbon by winning the 200 individual medley in a time of 1:57.70. Aaron Dies took first in the 50 freestyle in 22.02. Brock Zuyderwyk earned an NIC Championship in the 100 freestyle in 48.56. Penn placed first in the 200 freestyle relay in 1:29.25. Brock Zuyderwyk, Connor Craig, Joel Cummins and Kyle Brothers swam for the Kingsmen. Aaron Dies earned the NIC title in the 100 backstroke in 53.65. Evan Dies claimed the NIC crown in the 100 breaststroke in 1:00.53. Brock Zuyderwyk, Kyle Brothers, Aaron Dies and Evan Dies teamed up to win the NIC title in the 400 freestyle relay in 3:16.45.